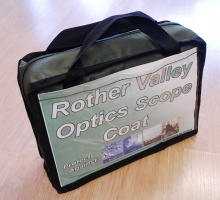 These brand new scope coats from Rother Valley Optics are the ideal for temporary telescope protection. They are all weather heavy duty woven polyester for maximum durability and protection. High quality, well made medium telescope cover by Geoptik. This is a fully weatherproof cover and has been tested in snow and high temperature conditions. The cover reflects 99% of the Suns UV rays for ultimate protection of your telescope equipment. High quality, well made large telescope cover by Geoptik. This is a fully weatherproof cover and has been tested in snow and high temperature conditions. The cover reflects 99% of the Suns UV rays for ultimate protection of your telescope equipment.